2K Sports continues to reveal new classic teams for NBA 2K16. Yesterday's reveal includes the 2007-2008 Boston Celtics and the 2012-2013 Miami Heat. There will be 12 new historic teams added this year. Four more teams have yet to be announced. Both throwback squads have won championships and had a "Big Three" with the Boston Celtics having Kevin Garnett, Paul Pierce and Ray Allen and the Miami Heat with LeBron James, Chris Bosh and Dwyane Wade. 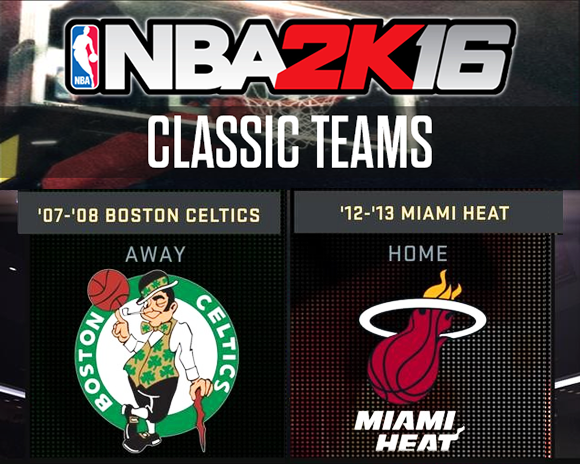 Which classic NBA teams would you like to play this year in NBA 2K16? Let us know in the comments. The NBA 2K16 release date is set for September 29 across Xbox One, PlayStation 4, Xbox 360, PlayStation 3 and Windows PC.